Q: I have a question about the two Chinese nationals who the Islamic State claimed to have killed in Pakistan. The statement you issued earlier said that the Chinese government is still trying to verify the information. Do you have any specific information now that they are definitely dead? Reports say that the two Chinese nationals were a couple. Can you give us any details about who these people were, what their names were, how long they have been in Pakistan, where in China they were from? A: Following the abduction of the two Chinese nationals in Pakistan in late May, relevant departments of the Chinese government and the Chinese Embassy in Pakistan launched the emergency response mechanism immediately. We have stayed in close communication and coordination with Pakistan and spared no effort to rescue them. According to the information offered by the Pakistani side, the two abducted citizens might have been killed. We are highly concerned about that, and are trying to learn more about and verify the relevant information through various channels. China firmly opposes and strongly condemns all forms of terrorism and supports Pakistan in fighting terrorist forces and safeguarding internal security and stability. China will work with Pakistan and other members of the international community to enhance counter-terrorism cooperation and uphold regional and global peace and security. To my knowledge, the relevant report is not consistent with the fact. These two people are not a couple and they come from different Chinese provinces. The details are still under investigation. Q: Chinese Vice Foreign Minister Liu Zhenmin has been appointed by the United Nations Secretary-General António Guterres as the next Under-Secretary-General for Economic and Social Affairs, replacing Mr. Wu Hongbo. How do you comment on that? A: China welcomes the relevant appointment by Secretary-General Guterres. Vice Foreign Minister Liu Zhenmin, who is experienced and capable, has conducted multilateral and bilateral diplomacy for a long time and is familiar with the UN affairs. We are convinced that after he assumes the post of Under-Secretary-General, Mr. Liu will push for new achievements by the UN in economic and social affairs and play a positive role in advancing the implementation of the 2030 Agenda for Sustainable Development. China sets great store by and actively supports the cause of the UN. Both Mr. Wu Hongbo and Mr. Sha Zukang, the previous Under-Secretary-Generals for Economic and Social Affairs, came from China, and they have been widely acclaimed for their important contributions to promoting international cooperation in the economic and social development. China stands ready to provide strong support for the UN's work in various fields. Q: Will the killing of the Chinese hostages cast a shadow over the Belt and Road Initiative given that Pakistan is an important country along the routes? A: There is no necessary connection between this incident and the Belt and Road. The Pakistani side has long attached great importance to protecting the safety of Chinese nationals and institutions in that country and made enormous efforts to this end. Pakistan and China have maintained close communication and coordination since this incident happened, and the Pakistani side has made all-out efforts to investigate the case and rescue the hostages. The Pakistani side has pledged to take necessary and effective measures to ensure the security of Chinese nationals and institutions in Pakistan. You asked about the risk in the building of the Belt and Road. I shall say that going global comes with risks. Since it was initiated three years ago, the Belt and Road has won extensive response from the international community and demonstrated strong vitality and broad prospects. As we can see, the world today is far from tranquil. With the thorough implementation of the initiative, it is inevitable that we may meet various security problems that call for serious consideration and proper handling, which is the case for any country engaging in foreign economic cooperation. The Belt and Road is a cause featuring extensive consultation, joint contribution and shared benefits, therefore safe and smooth progress in implementing the initiative calls for concerted efforts of all parties. We wish to make joint efforts with countries along the routes and take effective measures to create and provide a sound and secure environment for the smooth implementation of the Belt and Road Initiative. 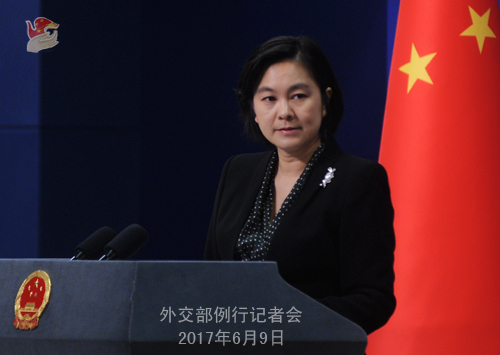 Q: Can we report that China is also confirming the death of the two people, or only the Pakistani side has informed you about the death of the two Chinese? A: Highly concerned about the incident, the Chinese side has tried to learn more about and verify the relevant information via various channels. According to the latest information from the Pakistani side, the two abducted Chinese nationals might have been killed. We express high concern about this information and have intensified our efforts to verify it via various channels. Q: The initial result of the general election in the UK suggests a strong likelihood of a hung parliament. It is predicted that there will be a bumpy road ahead for Brexit. How does China see the prospect for the UK? A: China has noted the result of the UK general election. This is the internal affairs of the UK and I will not comment on that. I want to stress that China will value its relationship with the UK as always and wishes to join the UK in advancing the bilateral relations. It is hoped that the UK and the EU can properly resolve the relevant issue through negotiation. Q: Indian Prime Minister Modi has just met with President Xi Jinping in Astana on the sidelines of the SCO Council of Heads of State meeting. Could you give us some information in terms of what were discussed at the bilateral meeting? Have they touched upon India's entry into the SCO? A: President Xi Jinping met with Indian Prime Minister Modi in Astana today. President Xi pointed out that the international environment is undergoing profound and complex changes. China and India, as the two largest developing countries in the world, should focus more on cooperation, advance side by side, lend support to each other's development, uphold world peace and promote common development. China highly values its relations with India and wishes to work with India to enhance political mutual trust, complement development strategies, deepen practical cooperation, maintain coordination and cooperation on major international and regional issues and push for the sustained, steady and sound development of China-India strategic and cooperative partnership. The two sides should work for closer high-level and institutional exchanges, strengthen strategic communication and synergize their policies. The two countries should also enhance trade and investment cooperation for more early harvests in such major projects as production capacity, industrial parks and railway construction. Efforts should be made to promote regional connectivity and common development, align development initiatives, push for substantial progress in the Bangladesh-China-India-Myanmar Economic Corridor at an early date and enhance cooperation under the framework of the Asia Infrastructure Investment Bank. It is also imperative to step up communication in terms of localities, think tanks, culture, media and tourism, strengthen communication and coordination in multilateral field to properly manage and handle differences and sensitive issues. President Xi congratulated India on its expected official membership of the SCO and stated China's willingness to strengthen cooperation with India under the SCO framework and jointly make positive contribution to the sound and steady development of the SCO. Prime Minister Modi said that India and China are ancient civilizations with a long-standing friendship. Against the backdrop of complex and volatile international situation, the sound India-China relations can serve as a stabilizer. The two sides should tap into the potential for cooperation, bolster communication and coordination in international affairs, respect each other's core concerns and properly handle differences. India appreciates China's support for its accession to the SCO and wishes to strengthen cooperation with China under the SCO framework. Q: The China-EU Summit did not issue any joint statement, including the one on climate change. Does it have anything to do with the EU not recognizing China's market economy status? I have a second question about President Xi Jinping's meeting with California Governor Jerry Brown this week. Is China doing anything to reach out to the Trump administration or anyone else in the US to get the US back on board with the Paris accord? A: First, while preparing for the 19th China-EU Summit, the Chinese side, acting in a positive, practical and flexible manner, engaged in negotiating a joint statement with the EU. 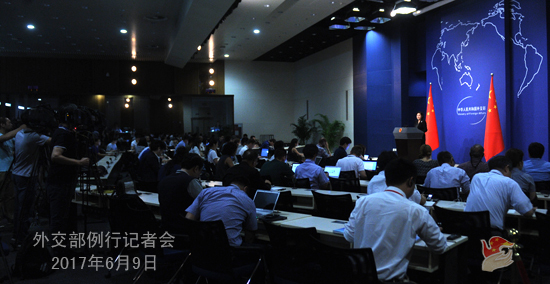 Although negotiation at the working level over the text of the statement was not finished in time, it did not stop China and the EU from reaching consensus and achieving positive outcomes at the Summit, about which we have released relevant information and given detailed introduction. With regard to the cooperation between China and the EU on combating climate change, I would like to say that China and the EU have so much consensus on combating climate change that having not released a joint statement won't hamper bilateral cooperation in this regard. China stands ready to strengthen exchanges and cooperation with the EU in such fields as combating climate change, clean energy and green and low-carbon economy, jointly abide by the principles of UNFCCC, promote the implementation of the Paris Agreement and work for the progress of global climate governance. You also mentioned the issue of market economy status just now. During the Summit, the two sides discussed EU's fulfillment of the obligations stipulated by Article 15 of the Protocol on China's Accession to the WTO and broadened consensus in this regard. China stressed that the EU should fulfill its obligations under Article 15 and send a signal to the international community and global market that the EU respects international rules. The EU said that they are revising relevant laws and will take non-discriminatory measures which are consistent with the rules of the WTO. As for China-US cooperation on climate change, we have pointed out on many occasions that in order to achieve sustainable development and deal with global climate change, China is willing to enhance cooperation with the US and other members of the international community to tackle climate change, forge ahead with the implementation of the Paris Agreement, uphold the outcomes of the agreement and promote green, low-carbon and sustainable growth around the world. Q: According to the Rodong Sinmun, the DPRK has accused China and US of initiating the resolution which was adopted on June 2 to put more sanctions on the DPRK. Does China have any comment on this? A: Resolution 2356 adopted by the UN Security Council demonstrates the unanimous position of the international community on opposing DPRK's nuclear and missile programs and upholding the international non-proliferation regime. The DPRK dropping its nuclear and missile programs represents both the explicit requirement of the UN Security Council (UNSC) and the extensive consensus of the international community. The UNSC resolutions reflect the unanimous position and requirement of the international community. We hope that the DPRK can heed the call of the international community, earnestly abide by relevant resolutions of the UNSC and stop nuclear and missile activities. As a permanent member of the UNSC and a responsible country of the international community, China stays committed to the denuclearization of the Korean Peninsula and implements the UNSC resolutions in their entirety. Meanwhile, China's position on developing good-neighborly and friendly relations with the DPRK is consistent and clear-cut. Q: Will the Chinese Foreign Ministry issue any advisory to Chinese citizens who plan to travel to this particular region in Pakistan. Or are there already prior advisories in place? A: The Department of Consular Service of the Foreign Ministry of China and relevant Chinese diplomatic missions always pay close attention to countries and regions with security risks, and issue travel alerts in a timely fashion. 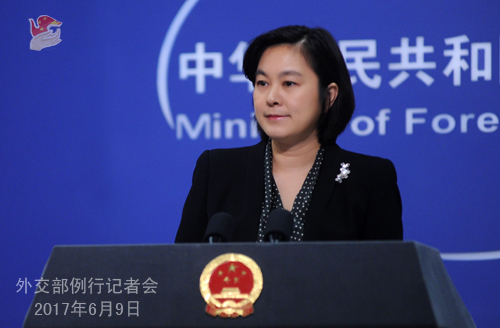 After the abduction of two Chinese citizens on May 24th, the Foreign Ministry of China and the Chinese Embassy in Pakistan have advised Chinese citizens not to visit the city of Quetta, the capital of Baluchistan Province of Pakistan for the time being. Relevant advisory is still in effect.